Diary: Finishing the play. And why it matters. Finishing the play. And why it matters. I feel bleary eyed tonight. 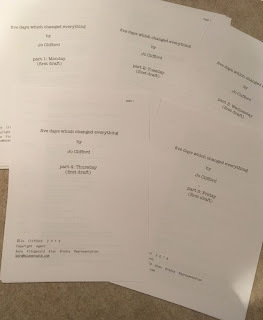 I've just finished printing out these five short plays. I finished the last of them this evening, just five minutes before a dear friend came to tea. And next week I will hand them in. I'm not quite ready to celebrate: I haven't read them yet. They're a serial, each of them 15 minutes long. I'm proud because I've written in that form before. Proud because they're the first new plays I've written for a while; and by the end of last year I was too ill to write anything. I wrote three of them this week. Parts three and four I'd finished by Wednesday. Part five I got stuck on. I was so distressed by events in the world yesterday that I found it so hard to focus on anything. And I'd made a mistake somewhere. It's a brutal process, this: make a mistake, take a wrong turning, the words won't come and you're liable to feel stuck forever. I had a singing lesson yesterday at 4.30 and suddenly half way through a song I understood where I'd go wrong. And by the time I'd arrived at the Filmhouse to see "A Fantastic Woman" I knew exactly what I had to do. I had to print everything out, go back to the very beginning, and rewrite everything. That way I'd know what had to be in Part Five. So I turned on the computer this morning before I'd even had my cup of tea to get the printing started. Part Five was still open. And the minute I saw the first speech I knew it had to go. And that somehow freed everything else and I started writing and never got out of my pyjamas till after two. And there was just one long speech to do. And I did it late in the afternoon. And this all frightens me. And yet I kept writing. I cooked a lovely meal for my friend. And I feel that's important somehow. That even in perhaps the smallest of ways it's an act of resistance that matters: not to be carried away by fear or by rage but to do what we can to be creative and hospitable and kind.